The Iranian community in Los Angeles and Southern California is quite large; some estimates place the number as high as 300,000 to 400,000, with most having arrived here in the 1970s and 1980s. This community now includes all of the religious faiths traditionally present in Iran: Mushms, Bahais, Jews, Armenian and Nestorian (Assyrian) Christians, Zoroastrians and various Sufi orders. The occupations pursued by the members of this community are as eclectic as those of the surrounding American society, and include medicine, engineering and all types of businesses — from banking and clothing boutiques, to frozen yogurt. Other less-Westernized professions include both hallal and kosher butcher shops, marriage solemnizing, calligraphy, and astrology. Los Angeles can also boast of locally-produced Iranian television and radio shows, and an Iranian “yellow pages” directory. There are also a number of “first class,” professional-quality performers of traditional Iranian classical music in the area. Most received their training before they left Iran. 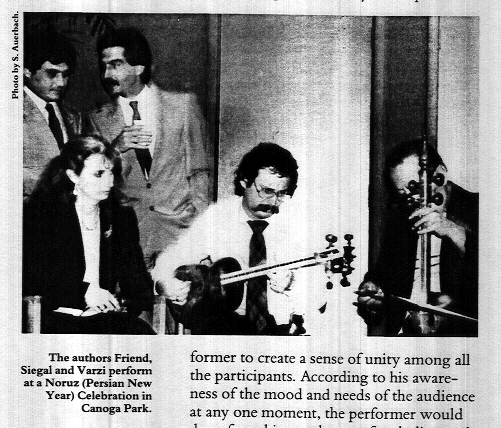 Some were well-known in Iran, including Mehdi Takestani, Mohammad Heydari, Aqili, and Alahe. 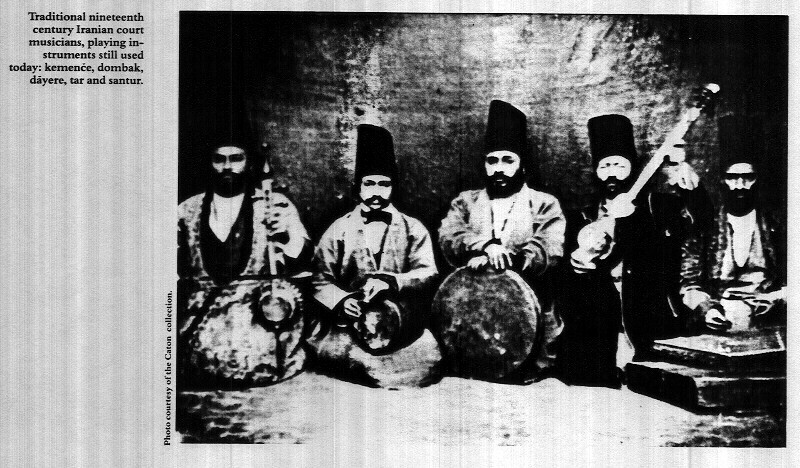 For some Iranian musicians who never played Iranian music, exile has increased the attraction of traditional classical music. In addition, there are many musicians and sin ers who perform Westernized Iranian popular music, such as Ebi, Hayde, and Vigen. Some musicians, such as Farhang Sharif, Mohammad Zolfonoum, Manouchehr Sadeghi and Morteza Varzi, were trained in the older manner of apprenticing themselves to a recognized master for a long period of time. However, most local Iranian musicians and teachers are conservatory trained. Rather than having studied “at the feet of a master,” they have learned a Westernized form of Iranian traditional music, using sheet music and Western-style, scientifically-organized teaching methods. This type of training stressed composed pieces, and placed less emphasis than did traditional methods upon the art of improvisation — formerly considered a vital element of Iranian traditional music. The musicians performing in the Cityroots Festival come from both apprenticeship and conservatory backgrounds. The preferred setting for playing serious” Iranian music has always been a gathering called bazm in a private home. The bazm is an intimate party at which refreshment and musical entertainment are provided. (The use of concert hall settings for Iranian classical music is a modern, Western-oriented phenomenon, whose history goes back only about 70-80 years.) In Iran, it was possible for a musician to make a living playing traditional classical music only in such settings. In Los Angeles, this is no longer the case. Thus, exile presents a conflict: the need to preserve “artistic purity” while making a living. Iranian nightclubs provide local Iranian musicians with their only opportunity to work as musicians. But the music played in such places consists of a combination of Iranized Arabic-style belly dance music, Iranian popular and dance songs and, at best, watered-down versions of traditional music. Many traditional musicians perceive performing in nightclubs as detrimental to the spirituality of their music, and explicitly avoid such places. This not only makes it difficult for them to make a living at music, it may serve to limit their exposure, and hence, their popularity. The traditional instruments for Iranian music include the spike fiddle kemençe, long-necked târ lute, santur hammered dulcimer and the tonbak drum. Because of the difficulty of obtaining and maintaining traditional Iranian instruments, some musicians tend to use available instruments, such as the piano, violin, electric guitar, and electric bass. Except for the violin, these instruments are unsuitable for playing traditional musical scales and modes, or for playing in the traditional intimate, contemplative setting. The traditional performance of Iranian classical music involves far more than the correct production of notes and lyrics. For Iranians, music is not exclusively an entertainment; they view it as spiritual as well as social — the language of God. The religious and spiritual roots of Iranian classical music are reflected in the serious and spiritual intent of the bazm. This is perhaps one reason why Iranian music has survived and flourished throughout history, despite numerous attempts by religious authorities to limit or ban it. Iranians feel that one must achieve a certain state of mental and emotional preparation before one can participate and contribute to the proper atmosphere of a musical performance. Therefore, an important feature of the bazm is the Iranian concept of hâl, originally an Arabic word which means “state” or “condition. In this context, hâl has acquired a mystical connotation, referring to the spiritual mood of the audience and the performer. One of the main responsibilities of the performer is to comprehend and facilitate the hâl of an audience and the total performing situation. In addition to affecting the audience, music can also change the performer. 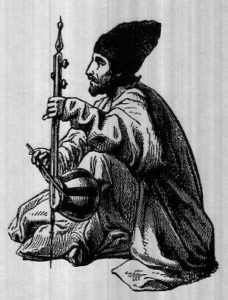 In a state of hâl, the musician does things which are not necessarily planned; the music flows from within, without the conscious effort of the musician. This is part of the improvisational aspect of the performance, which is considered so important by both musicians and audiences. In Iran, the success of a bazm was largely dependent upon the ability of the performer to create a sense of unity among all the participants. According to his awareness of the mood and needs of the audience at any one moment, the performer would draw from his storehouse of melodies, each of which have their associated moods. He would literally play on the emotions and spirit of the audience, drawing out of them sadness, remembrance, healing, or joy, as the inspiration moved him. To conclude the performance, a dance piece would be played so as to bring the audience back to the present reality and “break the spell.” Dancing would help the audience to release the emotional tension built up by the music, and would prepare them for the main meal, which marked the end of the entertainment, usually some time in the morning. The Iranian conununity in Los Angeles has brought many of their traditional cultural institutions with them. Not least of these is the bazm, which, in Los Angeles today, still retains much of its original character. A great deal of social status is still to be gained by having musicians — especially traditional musicians — at one’s parties, and in treating them well — attending to them with pillows, drinks and food. In accordance with custom, guests do not arrive on time. Drinks and light snacks are served as guests chat with one another. The main meal comes in the middle of the party around 10 or 11 p.m., rather than at the very end, as was formerly the case. The meal usually consists of Persian food, served in great quantities, and personally prepared by the hostess, together with her daughters, daughters-in-law and other female members of the household. Sometime after the meal, the lights are dimmed and the musical performance begins. This still conforms to a great extent to traditional practice: the order of musical events is identical to that introduced around the turn of the century. These events include the pish-daramad (rhythmic prelude), daramad (introduction of the musical mode), avaz (vocal and instrumental improvisations), zarbi (rhythmic pieces) and reng (dance pieces). Traditional modes and tunings are also used. In former times, the music went on until dawn; this is no longer possible in the close living situations of apartment life. Hâl still plays a central role in the bazm. Great emphasis is placed upon pleasing the musicians, as it is understood that in order for them to play well, they must feel relaxed and comfortable, and must feel that they are “in communion” with their audience. Dancing is perhaps more common today at the bazm than was formerly the case. However, the traditional attitudes that music is to be preferred over dance” and that “nice girls don’t dance,” persist. A girl or woman must still be given considerable urging before she will dance, even if she truly wants to do so. In any case, this is social dancing, not a professional entertainment. Due to a lack of professional traditional Iranian dancers in Los Angeles, a host who wishes to have a professional dancer at his party must resort to an American-style belly dancer.